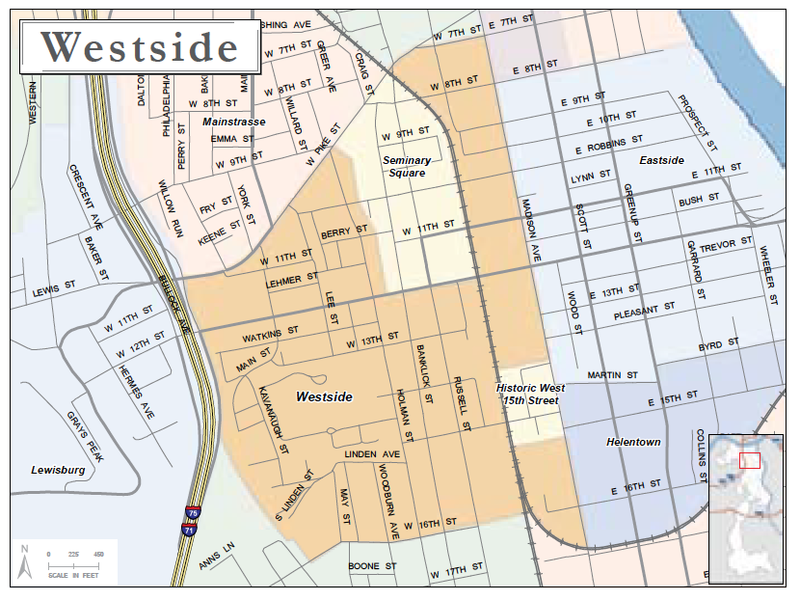 The Westside is a diverse neighborhood bounded by Pike Street on the north, I-75 on the west, 15th street on the south, and Madison avenue on the east. Historically, Covington's Westside was primarily a working class neighborhood housing trades people and artisans. There are many fine examples of Victorian era row houses built to accommodate the influx of population as Covington grew. Today, newer infill housing and rehabilitation of handsome 19th century buildings are increasingly attracting young professionals. Some areas of the Westside are designated as historic neighborhoods and other parts are eligible for historic designation. Much of the Westside lies within the Covington Arts District where new home owners are eligible for financial incentives to purchase and renovate buildings. The widening of 12th Street and the new St. Elizabeth Hospital facility are expected to have significant and positive impact on the area. Members of the Westside Action Coalition, working with the Seminary Square Neighborhood Association, are creating the Farny Art Park at Banklick and Robbins Street. Henry Farny, an artist with an international reputation, settled on Banklick Street in the early 1880's. During his years in Covington, Farny painted images of the American West that continue to be prized by museums and collectors today. This project will restore Farny to Bankklick Street—in spirit—and further the larger community's efforts to promote revitalization through such activities as creation of public art and development of green space. Many residents of the Westside have worked hard to maintain and improve the quality of life, to ensure the safety and tranquility of the neighborhood, and to keep a viable safe place to raise a family.